We are a modern, innovative company – soon to celebrate our ten year anniversary. With a team of experienced engravers and signmakers, alongside all the latest cutting edge machinery, we specialise in the design and manufacture of all types of signage to the highest specification. Quality products and ‘keeping promises’ is at the heart of our business, and thanks to these attributes, we have seen substantial business growth. Although we are based in the beautiful city of York, we supply signage products all across the UK. Whatever your sign requirements from one off vinyl labels to multiple engraved electrical labels, from simple banners to shop fascias. Most of all, we will provide you with a friendly, reliable service within the shortest of lead times. So, to chat through your requirements contact us now. 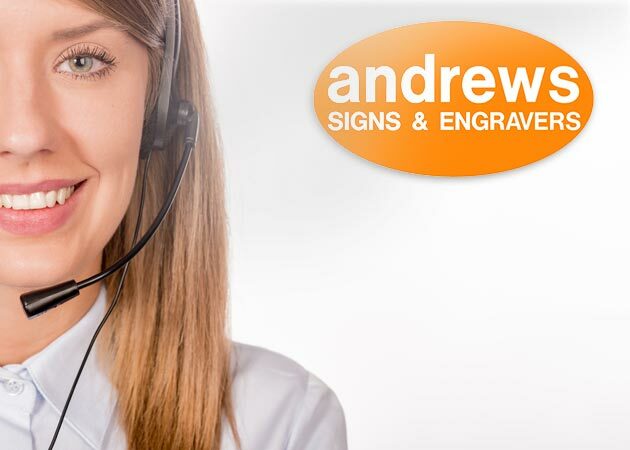 Andrews Signs have several sister companies, specialising in various product areas. Please find links below. Our ceremonial curtains are fit for Royalty and Dignitaries and can be hired throughout the UK with ease. Select your wheelie bin number from a large range of coloured and patterned letters and numbers. Available to buy online. Design your own bespoke cycle stickers online. In addition, add custom text and upload your own graphics. We provide an extensive range of attendance awards, school council badges, sports day medals as well as sporting and academic trophies. Due to working within the rail industry for many years, we have established a reputation for quality and service.